The average charge includes standard in-state charges for tuition, required fees, room, and board for a full-time undergraduate student who is a resident of that state. In 2011, the average in-state charge for a full-time undergraduate student to attend a public 4-year institution in the U.S. was $15,918. This is an increase of 84% over the $8,653 average charge in 2001 in current dollars and an increase of approximately 47% after adjusting for inflation. In 2010, the state average for a year of undergraduate education at a public 4-year institution ranged from a low of $10,768 in Utah to a high of $21,592 in New Jersey. Every state showed a major increase from 2001 to 2011 in undergraduate charges at public institutions. 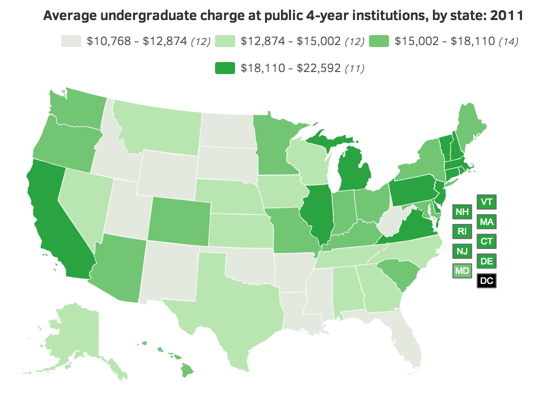 Undergraduate charges more than doubled in six states: Arizona, Illinois, Kentucky, Massachusetts, Minnesota, and Virginia. Tuition and required fees averaged 47% of the total charges at public 4-year institutions in 2011, but individual states had different cost structures.